Ideally located in Mission Valley, were the ideal gateway to experience the best of San Diego. Enjoy easy access to San Diego State University, SDCCU Stadium (formerly Qualcomm) , Old Town, or hop on the Rio Vista Trolley and explore Mission Bay, SeaWorld, and Downtown San Diego including PETCO and Gaslamp District. See our refreshed meeting spaces including our all-new event lawn ideal for memorable outdoor gatherings. Enjoy a host of amenities and services, from views and casual dining at DEN to our fully equipped fitness center and outdoor pool with a waterfall. Well-appointed guest rooms and spacious suites offer 55 SMART TVs, high-speed Internet and balconies and are perfect for groups visiting San Diego. Upgrade your stay to a Concierge floor and receive exclusive access to our private M Club Lounge featuring comp breakfast, snacks, and drinks. We are the only hotel in San Diego to have an M Club Lounge! 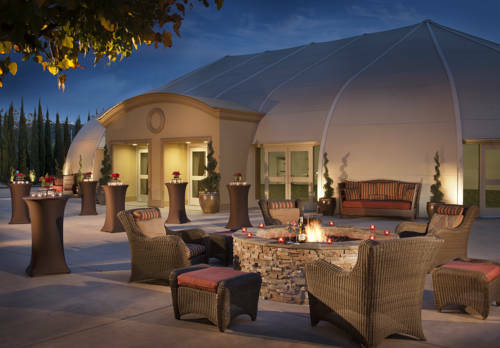 You will appreciate our Mission Valley hotel's unmatched charm and sophistication. DEN (DineEntertainNetwork): The DEN, our on-site Mission Valley restaurant, is the perfect place to dine, entertain and network with friends and colleagues. Relax and enjoy great selections from our menu featuring American cuisine and delicious dining in Mission Valley.